You might remember a few weeks ago when I questioned the legality of the claims being made by the Dairy Farmers of Canada at a recent Canadian Obesity Network conference. The issues at hand were two-fold. 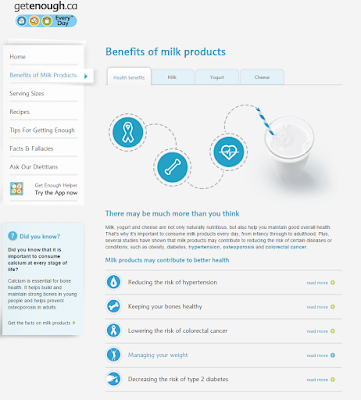 Firstly claims were being made about milk products' abilities to prevent colon cancer and type 2 diabetes, improve bone health, and confer healthy blood pressure. 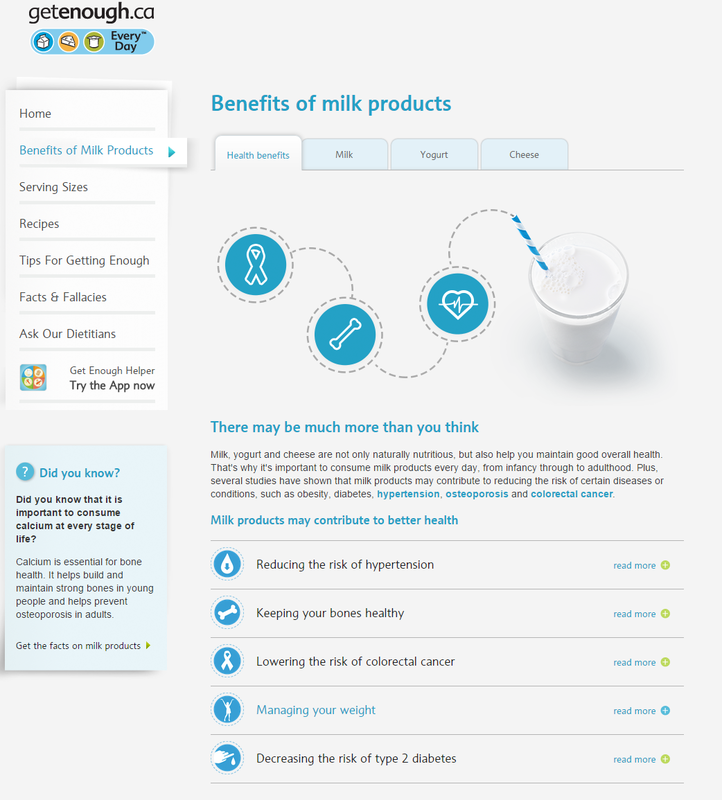 Secondly, those claims were being made about milk products as a whole, and not about the nutrients found in milk. "Nutrient function claims may not refer to the treatment, prevention or cure of a Schedule A disease; or claim to treat, mitigate, or prevent a disease, disorder or physical state; or claim to correct, restore or modify an organic function [3(1) and 3(2), FDA]. Such claims are considered to be drug claims (see Drugs vs. Foods)." "Nutrient function claims are not made for a food per se; they may only be made respecting the energy value or nutrients in a food. For example, the nutrient function claim "Milk helps build strong bones and teeth" is unacceptable, because a nutrient function claim refers to the nutritional function of energy or a nutrient (e.g., calcium) in a food, not a particular food (e.g., milk). 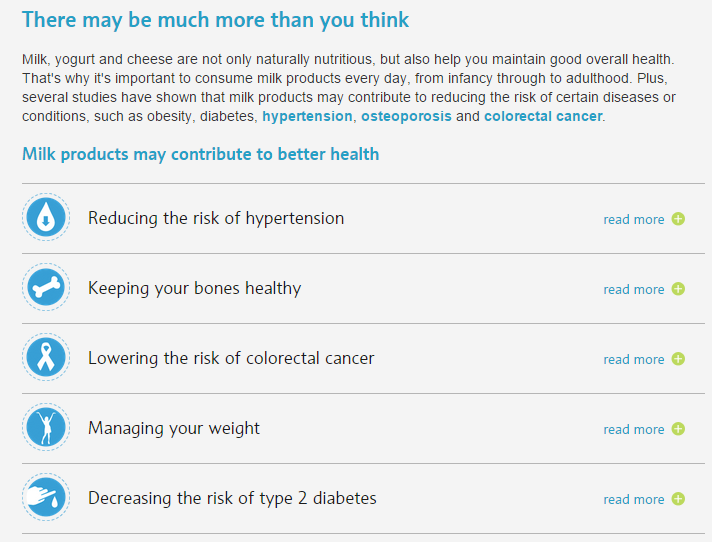 An acceptable claim is "Milk is an excellent source of calcium which helps build strong bones and teeth"." "By including the word "general" as a modifier in s. 3(2) the broad term "public" is narrowed. The section totally prohibits advertisement to the general public. It is designed not to interfere with advertisements to the "specialized" professional medical community in specialized trade and professional publications, such as medical journals, pharmaceutical journals and so on." 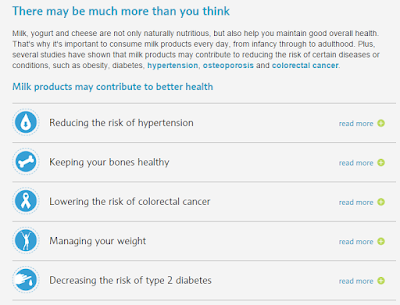 And yet here, the Dairy Farmers of Canada are claiming, on their "Get Enough" website (and the same information and graphics are available in its accompanying app) - a venue that's definitely targeting the general public - that milk products reduce the risk of hypertension, keep your bones healthy, lower your risk of colon cancer, help you to manage your weight, and decrease your risk of developing type 2 diabetes. My take on dairy literature is that milk products have not been proven to be magical or particularly dangerous. They're simply a protein source that includes calcium, and definitely aren't deserving of their own dietary category, or of their blind restriction. Seems to me though that the Dairy Farmers' inflated claims here might not meet the letter of the law - though perhaps there's another loophole that I'm unaware of that makes these kosher too. If you'd like to read a different viewpoint on dairy, here's an interesting Q&A with Alissa Hamilton, the author of Got Milked, whose tough talk on dairy is certainly more extreme than mine, but if you're looking for something to balance the Dairy Farmer's magical claims, definitely have a peek.